Keep warm in the cold weather with our men's Harley-Davidson® fleece jackets. 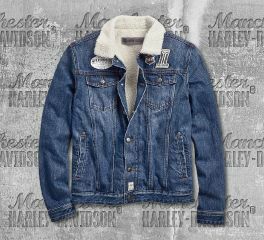 Harley-Davidson® Men's Sherpa Fleece Denim Slim Fit Jacket. Sherpa lining adds warmth. Made from 100% cotton denim with specialty wash for washed-down look. 100% polyester Sherpa fleece collar and body lining. Button front and cuffs. Snap hand-warmer pockets. Button flap chest pockets. Snap-down collar. Button waist tabs. Rivets on hand-warmer pockets and cuffs. Woven label. Printed patches. Slim fit, fits closer to the body.